Katie Loesel grew up on Lake Erie in Erie, Pennsylvania and studied printmaking at The Cleveland Institute of Art in Cleveland, Ohio. She makes prints, drawings, installations, and books. She also sews objects out of sail cloth under the guise of Windy Seas. Her current body of work explores ideas of piling, webs, and balance. “Through worlds and structures comprised of geometric shapes, lines, and ladders, I explore just how much can be piled up before it falls down,” writes Katie. 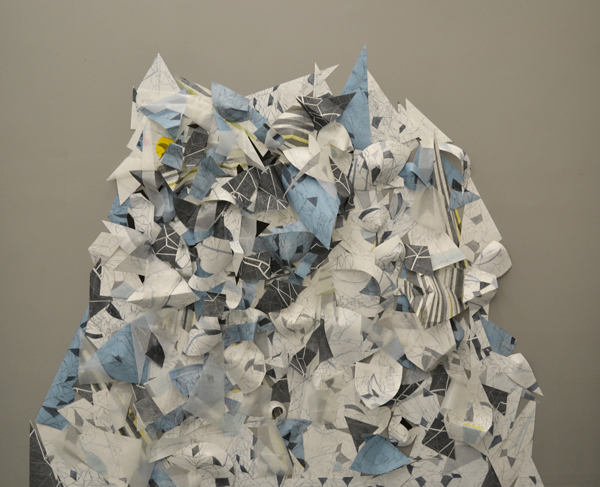 “Jungle gyms, constellations, transmission towers, and mountains twist, climb, and interconnect.” Gihon Glacier (image above) is a five-foot by five-foot pile of collaged intaglio and monoprints. The paper twists and climbs and points with an icy palette of soft blues and greys. In 2011, for Figment Boston, Katie collaborated with Luke Cady on Fiber Fort (image below), an interactive public sculpture made of old t-shirts. Katie and Luke set up the structure and passers-by added pieces of t-shirts. The result was a summertime igloo made of the twisted stretched fabric of the shirts; a colorful celebration of cooperation and shelter. (Nifty video here.) Fiber Fort and Gihon Glacier are examples of Katie’s ability to tap the emotional path through a concept and bring it to light in a beautiful object. We had the pleasure of meeting Katie in Vermont a few years ago before she took off to Thailand and Boston. She recently moved back to Vermont where we had the chance to reconnect with her.